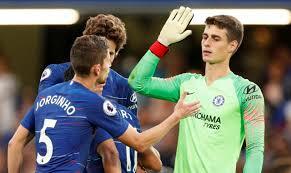 Chelsea manager uncertain if Kepa will feature on Wednesday - SABC News - Breaking news, special reports, world, business, sport coverage of all South African current events. Africa's news leader. Chelsea manager Maurizio Sarri is uncertain if Kepa Arrizabalaga will start Wednesday’s Premier League match against Tottenham Hotspur after the goalkeeper’s refusal to be substituted in their League Cup final defeat by Manchester City. Chelsea fined Arrizabalaga a week’s pay and he apologised. Sarri said the Spanish goalkeeper would be mentally ready if he is in the starting line-up for the clash at Stamford Bridge. “I need to send a message to my group, whether Kepa is on the pitch or off it. I have to decide what’s better for my group,” the Italian coach told a news conference. I don’t know. I have to decide yes or no. It’ll be the decision of the group, of all the players. He made a mistake, there are some consequences. If it is to play he has to be ready, if it is on the bench then he has to be ready,” says Sarri. Arrizabalaga appeared injured in the closing moments of extra time on Sunday and Sarri ordered his substitution only for the world’s most expensive goalkeeper to infuriate his manager by insisting he was fit to continue. Sarri described the situation as a “misunderstanding” and added his players were “shocked” by the scenes at Wembley. “It was a very unusual situation so the players were very shocked. It was impossible to react immediately. I spoke to Kepa, I spoke to everyone. He said sorry to the technical staff, but it wasn’t enough. He said sorry to the players and the club. We don’t want to kill him,” explains Sarri. Defeat by City in the title clash and Chelsea’s poor league form, with three losses in the last four matches, has heaped pressure on Sarri but the former Napoli boss is not worried about his future. “I’m not under pressure, you have to ask the club. I don’t know why you ask me. I want to win every match,” says Sarri. Chelsea are sixth in the table with 50 points from 26 games. This entry was posted on 26 Feb 2019,05:12PM at 5:12 PM and is filed under Sport, Homepage Featured Story Slider. You can follow any responses to this entry through the RSS 2.0 feed. Both comments and pings are currently closed.